"This easy, quick, and light dish has exceptional flavor. The rosemary plays perfectly with strong garlic flavor and a hint of lemon for bright fresh flavor. This is a must try for summer." Whisk garlic, olive oil, rosemary, mustard, lemon juice, ground black pepper, and salt together in a bowl. Place chicken breasts in a resealable plastic bag. Pour garlic mixture over chicken, reserving 1/8 cup. Seal bag and massage marinade into chicken. Let stand for 30 minutes at room temperature. Place chicken on preheated grill and cook for 4 minutes. Turn the chicken, baste with reserved marinade, and continue to grill until cooked through, about 5 minutes. Cover with foil and let rest for at least 2 minutes before serving. 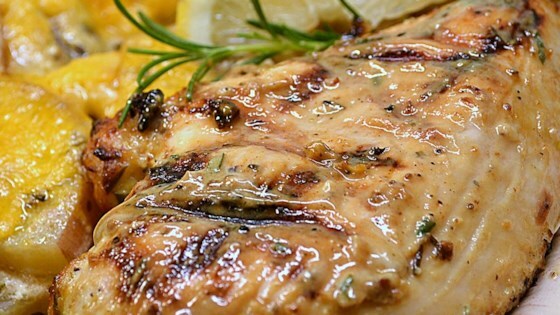 Watch how to make this recipe for top-rated grilled chicken.